Despite the impact of work, wedding planning and Super Metroid fan-hacks (not necessarily in that order ;-) on my freetime, my scheme to design a DIY-able open pick & place system is starting to come along. So far, there is a proper vacuum placement head, a rough idea of what the software architecture might look like, and this. For those who saw the last post, you probably guessed what it was leading up to. 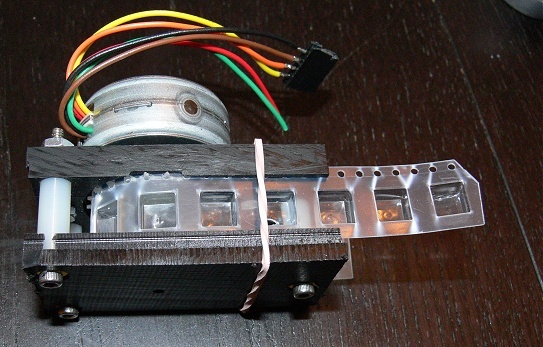 This is a simple proof-of-concept of a SMT tape-and-reel part feeder design. The main parts are a stepper motor and feed sprocket to advance the tape, two walls with guide slots, and a simple slider mechanism to allow the feeder to accept tapes of varying width. Please note that it does not (yet) include any mechanism for peeling and disposing of the tape covering. Suggestions and innovations in this area (as well as all others) are welcome! All the parts were cut on a CNC mill – design files and G-code are available here. The .cb files included can be opened with the free version of CamBam. More photos / video and design details are available below. On opposite side of tape – ending edge of component wells to edge of tape: 0.6mm min. Tape thickness: 0.2 ~ 0.4mm, not including covering. The standard tape widths are 8/12/16/24/32/44/56 mm. 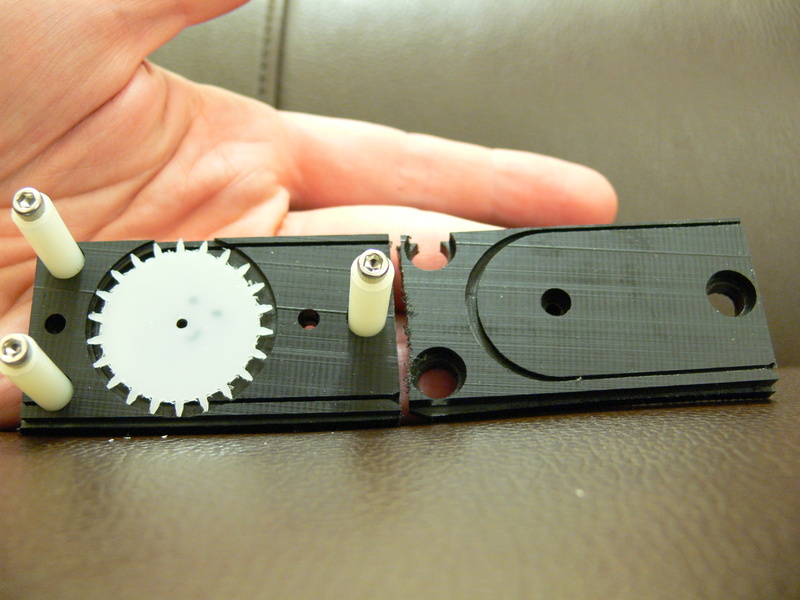 For tapes 32mm and wider, a row of slightly elongated (same pitch) sprocket holes is added to the other side. According to various sources, the standard also says the pitch between part wells should be a multiple of 4mm and “Pin 1” (if any) should generally be on the sprocket side and facing forward. A longer explanation of the part orientation rules is that the part should be a) widthwise (its longer dimension, if any, across the tape); b) Pin 1 toward the round sprocket holes (unless this conflicts with the first rule); c) Pin 1 facing in the direction of travel (unless this conflicts with the first 2 rules). How religiously any given vendor adheres to these rules is anybody’s guess. There is also no rule saying the ‘well’ or pocket holding each part has to remotely match the size of the part (except to prevent it being able to flip over or rotate 90 degrees during shipping), so visual positioning correction is occasionally needed for parts from particularly lazy vendors. Sprocket thickness of 0.7874mm (.031″) – this is a ‘standard’ stock thickness in the US, so it was an easy first test. I sunk the sprocket so that it lies flush with the inside wall. With these values, the depth of the tape track is cut to 2.14376mm (0.0844 inches) to put the edge of the tape flush with the track when on the sprocket, forcing it to stay straight despite all the feed force being delivered on one side. For the ‘outside’ (non-driven side) wall, the track is cut to a depth of 1mm (0.039 inches). The width of the slot is 0.79375mm (0.03125″), as this is the closest (commonly available in the US) milling bit width that will accommodate both plastic and the slightly thicker paper tapes. To assist loading tape, a wider ‘mouth’ is cut on the input side of both sides’ slot, tapering to the slot width to guide the tape in. In reality, the mouth you see in the photos is not really large enough to be useful (it looked a lot bigger on my monitor!…). Also, the mouth on the non-drive side in the photos is on the wrong side since I completely forgot to account for this half being flipped over :p These are corrected in the downloadable files. With the sprocket as designed, the tape track radius is 13.6mm (0.536″), and the track makes a 180 degree pass around the sprocket to eject the spent tape at the bottom of the same end it comes in on. In hand-testing some tape around the sprocket, I found it does not always sit flush against the sprocket throughout the entire 180 degrees, so the tape track is widened a bit around the sprocket to accommodate. The ~31mm sprocket diameter / number of teeth (22) was chosen purely for convenience on my part, as this is the tallest that would comfortably fit on the homebrew CNC mill I’m using for testing. In practice, a larger diameter is advisable so as not to limit the size of parts (deepness or length of the ‘wells’ vs. sprocket diameter and bend radius) that can be fed. Also, the reels themselves will be much taller than this anyway. Just keep in mind that as sprocket diameter goes up, so will the required motor torque to advance the sprocket one step, and the linear distance per step. At some point some form of gear reduction will be necessary vs. simply tacking the sprocket directly to the motor shaft. To handle a wide (pun intended) variety of tape widths, a trio of smooth nylon PCB standoffs (0.250″ dia) are sunk and bolted into the drive side to act as sliding rails for the halves to be pulled apart to the desired width. A rubber band around both halves keeps them tensioned and in contact with the tape edges when loaded. This could definitely stand improvement, but it works for now. Despite being a quick ‘n dirty test piece, the action of this feeder (by hand) is surprisingly smooth. The nylon spacers are pretty slippery, and the Delrin also provides a smooth, low-friction surface when machined. With the motor is a different story; these tin-can motors are 7.5deg/step and the driver board I’m using right now doesn’t really support microstepping low-current motors. This entry was posted on Sunday, February 27th, 2011 at 3:18 am	and is filed under gEEk. You can follow any responses to this entry through the RSS 2.0 feed. You can leave a response, or trackback from your own site. This guy has used the feeder to advance the tape. Have you considered how multiple components feeders will fit together? traditionally feeders are rather thin so you can stack a heap of them together quite closely. The tape covering is the biggest problem. Simple strategy would be to place a fishing weight to keep a constant force. 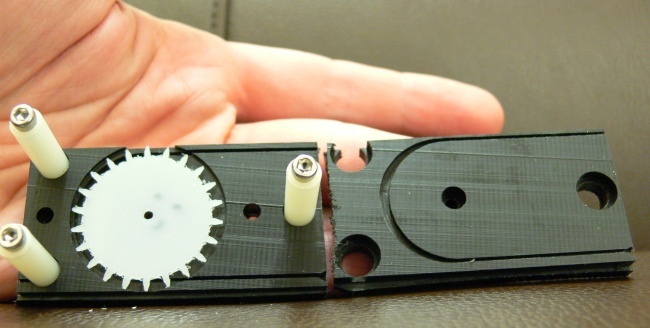 Could you pull the plastic tape instead of advancing the sprocket? 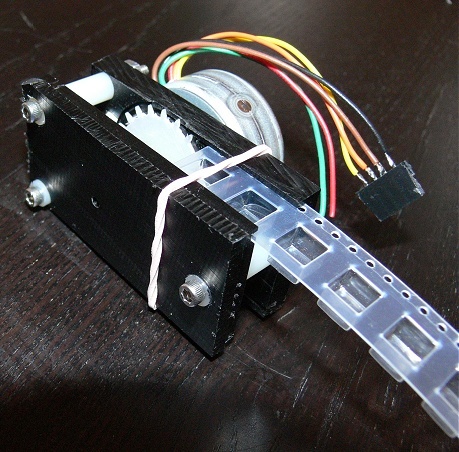 From what I can tell of the design shown in the video below, the plastic tape must be pinched then you see an arm pushing on the plastic tape that feeds the next component along. These are some good points. So far I have seen homebrew machines using the head or needle itself to advance the tape, held down in a small jig like this one. I’m a bit worried about doing this though; the Luer lock needles like used here can get bent easily, and won’t work at all if there is a suction head larger than the sprocket holes. This one (http://www.youtube.com/watch?v=h5y0tebV86E) used a separate solenoid-ish mechanism to advance the tape, then retract for the remainder of the operation, saving the needle from abuse. The reason I approached it the way I did is that the motors are dirt-cheap and all the pieces can be cut from flat stock easily. ‘Universal’ was another goal – the same feeder, let alone design, will accept any size tape. Admittedly as the number of feeders goes up, having a single or head-mounted feed mechanism starts to look better and better. As for stacking them… that’s a near-future problem! :-) The stock I used is much thicker than necessary… to make efficient use of space (and due to motor torque limitation) I’d probably move the motor to be ‘inside’ (between the two walls). For attachment, I was thinking about a rack of sorts they could be hanged on, consisting of 2-3 metal rods. A bit hard to explain without a diagram, but imagine a hooklike feature on the top-front to hook over the first rod, and a notch at the rear that could slightly ‘lever-over’ a 2nd rod, which rests in the notch and holds the feeder in place (like what holds most inkjet printer cartridges in position). The 3rd rod, if used, would be for the bottom-front of the feeder to rest against, and would probably only be needed if the rods doubled as a power/data bus to the feeders (like the 3-wire bus used with the blinkenlichten. For the tape-peeling problem, I was kicking around the idea of a small belt-driven friction roller (belted to the sprocket motor shaft) at the top just before the sprocket, gently pulling the covering backwards just a bit faster than the sprocket turns (the difference would take up any slack, after which the roller could slip against the covering as needed) and ejecting it out the side/top. Fishing weights is an option too (I think some entry-level commercial units use this). I like the suggestion of just pulling on the covering directly and forgoing the sprockets entirely though! The plastic tape could be wound onto a second spindle with ease if you could apply a constant turning force to the spindle. The force would have to be high enough to pull the plastic tape off and low enough not to advance the drive motor of the feeder. My guess is a constant force spring with some sort of motorised winding would be the go. The thicker the feeder the further travel that will be required by the placement head. This will reduce the CPH placement of the machine and potentially lower the number of different parts that could be assembled. One way to over come the width caused by the motor, other then mounting the motor inside as you stated, would be to offset the positioning of the motor. This would allow the motor of feeder 1 to over hang into position 2 because feeder 2’s motor is located some where else. If you look at the designs of many of the commercial feeders ( god I love online patents http://www.google.com/patents?q=tape+pick+and+place+feeder&btnG=Search+Patents ) there are alot of parts to one feeder, as a result each feeder is not cheap. In terms of material costs and component count this would be the most expensive part of the system (depending on how many parts wish to load into the pnp machine). As your goal here is to create a low price open source pick and place machine, I think the feeder design needs careful consideration. Maybe the simplest method would be a separate tool permanently mounted on the head for advancing the tape, but this would lower the CPH count. This would require the old fishing weights to pull the plastic tape. 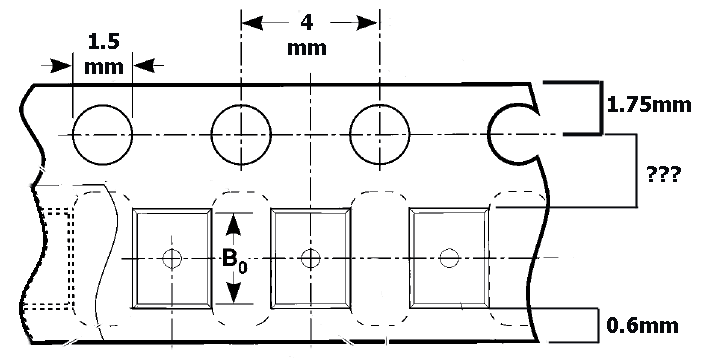 The use of a separate feeder head, mounted on a X and Z axis only would create a system with a high component count that was extremely cheap. The feeding could occur while the main head is placing the previous part so it would not deteriorate the CPH rate as mounting it onto the main head would. Also adds great flexibility for component variations as this would all be handled in software. A vision system on the feeder head could determine the exact position before pickup so the pick up head was able to target dead centre and perform and rotation if the part was not perfectly aligned or needed additional rotation. A pressure sensor attached to the vacuum supplied to the pick up head would detect if the part has been picked up correctly. For this design would still have the same issues with disposing of the plastic tape. Applying a constant force would advance tape if all of the mechanics was in the feeder head. Another idea is to have the plastic tape loaded onto a reel that is motorised (on each reel). The tape is advanced by pulling off the plastic tape and an overhead camera determines how far (how long the motor should run for) the tape moves and correctly sets the location of the part to be picked up. I hope I have added some value here. If you want to use a DC motor to wind the tape up after its been peeled you need to drive the motor with a current controlled circuit. The torque from a motor is proportional to the current running through it. Typically people run motors with a constant voltage which in this case would mean that at stand still the motor would try to pull the tape with high force and rapid acceleration until it reaches its running speed. That’s not something you want here. In this case if you supply a constant current to the motor it will start up with low torque and keep a constant torque no matter what speed it was travelling. Essentially it would behave like weighted line, without the problem of having to reset it. Then you could attach a take up spool to collect the tape, or use a pinch roller to feed the tape out onto the floor. A constant current circuit can be made with a simple LM317 and a resistor in a constant current drive configuration. I’ll attach a circuit soon if you’re interested. I’m an electronics engineer and I’ve also started to build a do it yourself pick and place machine, and that’s why I landed on this page. I figured the feeder mechanism was the first item on the list as its the hardest part of the system. The feeders need to be thin so that the pick up mechanism doesn’t have to travel as much. I liked your sprocket idea, but I’m having trouble locating suitable sprockets and I don’t really have a CNC machine available other than the one I built myself which doesn’t have the accuracy or software I need to cut sprockets. You’ve also got the tape and size problem to solve. Seeing the youtube image of that feeder that pinched the tape it becomes clear that’s the way to go. I was planning to use a motor to pull on the tape and spool it up at the same time but the designs I sketched out all involved lots of gears and things and it always ends up too wide. Its also critical to keep the component count down as each gear is expensive and the cost gets multiplied by as many feeders used in the machine, essentially a factor of 20 or more. The video doesn’t quite show the exact pinching method used. The tape needs to be kept taunt during a pinch motion, and then shuffle off in the right direction, but I can’t quite see how that’s being done. Anyone have any ideas, or a better view of the internals of this thing? Hey btw on a commercial tape an reel, the sprockets are on the left side. I program 2 production PNP lines at work, and also am in to PNP robotics at home. Sorry about the double post, there is no edit button. If you can get on irc.freenode.com #robotics or ##electronics. I can pass along some info, also grats on the feeder proof of concept. I’ve been up close and personal with a couple of different kinds of feeders, and they all peel the tape the same way. There’s a metal wedge that clamps down over the tape, with the thin end pointed in the direction of feed. the tape is pulled back over the edge of the wedge and taken up on a reel driven by a small motor with an o-ring as a belt. The reel drive needs to be constant torque, but that’s trivial if you can do everything else involved. Just drive the motor with a constant current source. It is specified – see Dimension to centre of SMD component “F” – Google = Tape and Reel Data Carrier Standards.